In the interests of full disclosure, I have to start out by saying- Twelfth Night is my very favorite of Shakespeare's plays. For me, it has everything. I love its humor, its darkness, its words, its songs, its characters and its silly, impossible love story. In some ways, this makes me easy to please- if you say these words, I'll be happy just to hear them again- but in others, it makes it hard- I have to admit that the very best night of theatre I've ever experienced was a production of Twelfth Night. Astute readers might even note that my name here at Two Hours Traffic is "rudesby," which is an early modern insult found in one of Olivia's lines. I'm a fangirl. But here's the other thing. I'm a sucker for productions that explore Renaissance theatrical practices, and right now, no one does that better than the American Shakespeare Center in Staunton, VA, where the Actors' Renaissance Season is kicking into gear for its sixth year of actor-led performances. 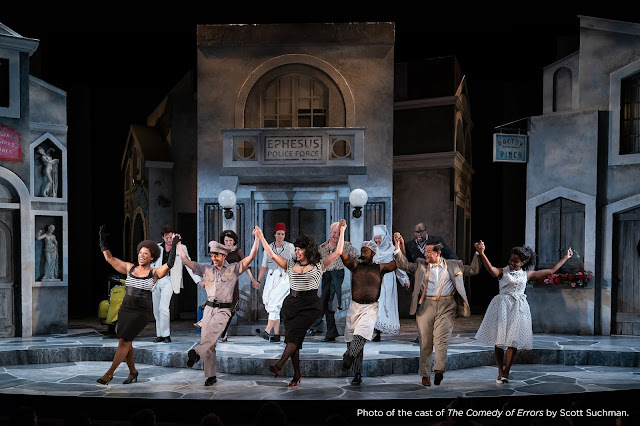 In the Ren Season, not only are the usual hallmarks of the ASC present (shared lighting between the players and the audience, wonderful music from the actors, and lightning-fast text), for three months, the company operates without a director. The actors take charge of their own plays and stage them with only a few days of rehearsal. This production was up and running in three days. That sort of thing gets my geekdrive into full gear, but what about the rest of you? Does it work? Can three days and no director really make a watchable play? I can tell you this with such assurance because when I saw the play, it was a matinee performance for high schoolers. Let me be clear- I saw a theatre filled with HIGH SCHOOLERS sit down and watch a four-hundred year-old play as though they were watching an episode of (sorry) "Jersey Shore." Astounding stuff. The show resists being stolen utterly because of the strength of the rest of the cast. When Miriam Donald and Gregory Phelps are on stage as Viola and Orsino, you can't help but be drawn instantly into their love story (and the staging of "Come Away, Death" is one of my favorites I've ever encountered). Every time a plot line reenters the stage, I was eager to see how the the actors would play it, and I was rarely disappointed. Hmm. Play. Play is an excellent word to end on. It's one of the strengths of the Ren Season that the actors really are given a chance to follow their own instincts and intuition. They get to play. And what they produce is a play I can recommend to anyone. If you're in Staunton, GO. If you're not in Staunton, what's wrong with you? Get in your car and take a day to enjoy a wonderful production of a fantastic play- you won't be disappointed. Aha! nice contrast -you love Twelfth Night and I do not ...makes for an intersting set of reviews of two productions. Love it.